If you’re ready to get away from all the hustle and bustle, you’ll love this 5-bedroom 3-bathroom oceanside home in Corolla that combines the elegance of modern living with the charm of a coastal cottage. The amenities at Monkey Sea Monkey Dune will make you feel right at home and you’ll be relaxed thanks to all the stunning views. At only 4/10ths of a mile from the coast, you’ll be tanning on the beach after just a short 7-minute walk. 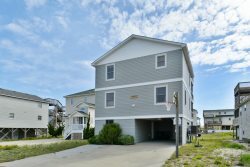 Located on a private cul-de-sac in the Ocean Sands neighborhood, Monkey Sea Monkey Dune has parking space in the driveway and room for one vehicle under the house. Outback, you’ll love floating in the sun in the private, solar-heated pool and grilling up some burgers on the outdoor grill. An outdoor shower is also available. Inside, the competition will heat up as your family plays pool in the large game room with a Queen Sleeper Sofa that provides additional space for large families. The kids will love staying in their own space downstairs with the attached Bunk Bedroom. The mid-level offers peace and serenity as you catch a great night’s sleep in the beautifully decorated Queen Master Suite with full bath. Another comfortable Queen Bedroom and Bunk Bedroom are adjoined by a full bathroom. Finishing off this level is a laundry closet with washer and dryer. Out on the deck, take a dip in the bubbly hot tub or enjoy a cup of coffee on the porch swing as you soak up the ocean breeze. The top-level provides some of the best views in the Outer Banks. With both a sundeck and screened porch, you can enjoy the coastal air and gorgeous skies no matter the weather. Inside, the spacious main room includes a cozy living area with flat-screen TV and fireplace, a modern kitchen – fully stocked with seating for two at the bar, and a dining area that is perfect for family dinners. The King Master Bedroom with whirlpool tub and shower will be a relaxing oasis after a long day in the sun. With ceiling fans, natural light from all the windows, and nautical décor all around, you’ll want to come back to Monkey Sea Monkey Dune year after year. When you stay at Monkey Sea Monkey Dune, you’ll never be far from fun, local attractions. Three minutes down the road, visit the TimBuck II Shopping Village featuring over 60 local restaurants and shops, all on the Currituck Sound! With options like Upside Restaurant & Bar, Mama Easley’s Grub Hut, and Corolla Cupcakes, just to name a few, there are plenty of tasty dishes to sample after strolling through Kitty Hawk Kites, Cotton Gin, Nags Head Hammocks, or one of the other great shops. If you love lighthouses, be sure to drive up to the Currituck Beach Light Station and climb the 220 winding steps to the top for amazing sound and ocean views. For a truly unique Outer Banks experience, stop at Corolla Outback Adventures for a wild horse tour – and ask about our Club Seaside promotions for a great deal! Make your next vacation one to remember when you book Monkey Sea Monkey Dune.